French general; born at Carpentras, Vaucluse, Sept. 20, 1852. He was educated at the Ecole Polytechnique and the Ecole d'Application de l'Artillerie et du Génie; and, after reaching the rank of captain, he studied at the Ecole Supérieure de la Guerre from 1878 to 1880, when he was attached to the staff of the general of division in command of the artillery and fortifications of Paris. In 1884 he was made commandant of the third battery of the seventh battalion of artillery, and two years later was appointed officer of ordnance to General Boulanger, then minister of war. Valabrègue was made lieutenant-colonel in 1898, and colonel in 1902, when he became commandant of the Ecole Militaire de l'Artillerie et du Génie. In 1904 he was appointed "chef de cabinet" to the Ministry of War. In 1905 he became brigadier-general and was made commandant-in-chief of the Ecole Supérieure de Guerre and member of the technical committee of the general staff. 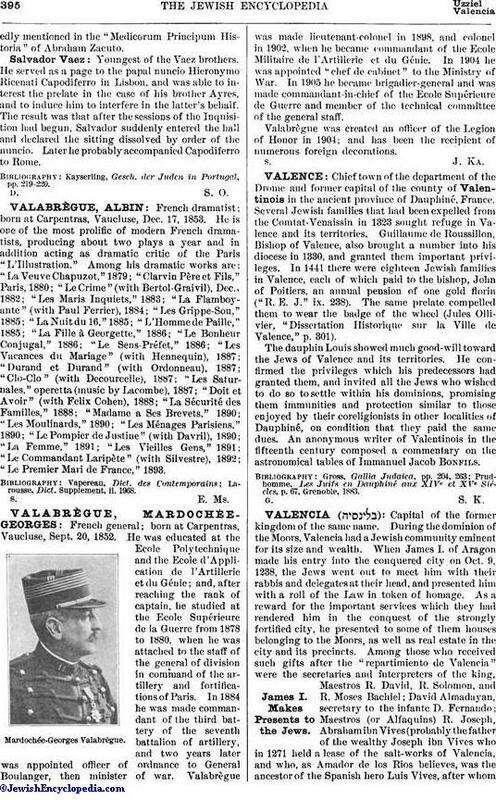 Valabrègue was created an officer of the Legion of Honor in 1904; and has been the recipient of numerous foreign decorations.